Automatic SQL injection and database information gathering tool. - sqlcake is an automatic SQL injection exploitation kit written in Ruby. It's designed for system administration and penetration testing. - sqlcake offers a few useful functions to gather database information easily by sql injection usage. 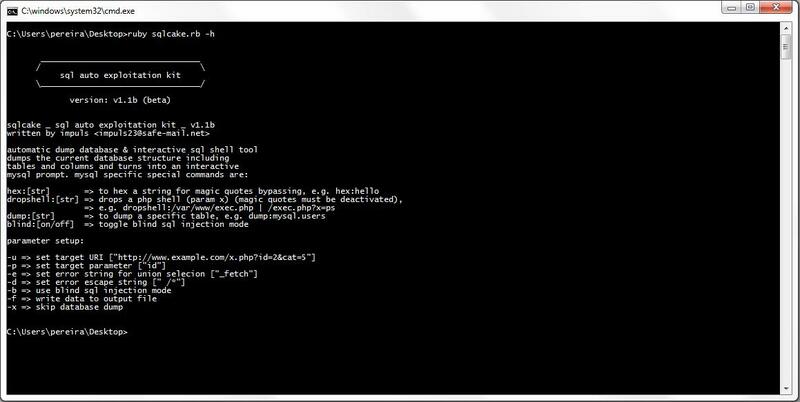 - sqlcake also allows you to bypass magic quotes, dump tables and columns and gives you the possibility to run an interactive MySQL shell. - sqlcake supports union stacked queries for real fast processing and blind injections with logarithmic techniques for saving time.